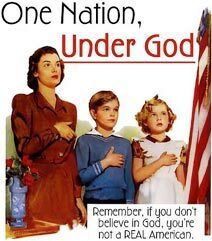 I hear many Christians stating that this is a Christian nation. This is obviously not so, because we still have some freedoms that the upper class and the religious right have not yet been successful in eliminating. However, let us indulge them for a moment, let us look at what it means to have a Christian nation. First thing to go is Science. It is a topic hotly debated already. Science gave us the Theory of Evolution, which is obviously against God, so all science must be evil and must no longer be taught. History also tends to back up science, especially when many different sources are consulted to help eliminate bias, but this field of study also quite often fails to support the existence of God or Jesus. Therefore we don’t need that to be taught either. Biology and Social studies aren’t needed either, since all we really need to know is God’s will and that is found only in the Bible. Therefore henceforth school will only teach the Bible with a smattering of basic math so that one can offer up the proper tithe. This frees up a great many frustrated teachers to get jobs closer to God like the Priesthood, or some capacity in the church. Failing that they can become farmers and the women can go back to being housewives as they should. This also means that we don’t need scientists, pharmacists, doctors, nurses, historians, librarians, physicists or any other advanced positions that science brings, because they are only there to subvert God’s will. No longer will we take extreme measures to save premature babies or use advanced medical techniques to ease and prolong the lives of the elderly. God’s will must take its natural course and not be thwarted! Forget all this medicine for women’s needs, whatever they have to deal with is a part of being a woman as God decreed. We should stop interfering with the natural processes God built into women. Again, all these people can also join the clergy or become simple honest farmers so that they can be closer to God. That’s a good start, but now we must enact actual laws to live by. Our present legal system favors the criminal, while lawyers get rich off of arguing cases for people whom they know are guilty. It is time to go back to God’s holy law! All have sinned, and the wages of sin is death. No, not just the heathen, it says ALL, even the Christians must be subject to God’s perfect law, and all crimes are punishable by death. There were no prisons in Jesus’ time except for debtors prisons. If you owed someone and couldn’t pay them, they took the matter to the local magistrate and he threw you into a large cell with others of your ilk, till your friends and family could come up with the amount you owed. Oh, and forget the government having to feed you or provide sanitary conditions, if you get food your family must bring it to you daily. But I digress; let’s get back to the law as put forth in the Bible. Jesus said that women should be totally subservient to their husbands, so no more equality of citizenship. Sorry. If you disobey your husband, he has the perfect right to take you to the walls of the city and declare that you are a disobedient wife. At this point she is to be stripped and stoned by everyone there until it is certain she is dead. Then she is to be left for the vultures to pick at her bones as an example to all others. Disobedient sons get the same treatment, and by the way, proof is not needed! We don’t need a large ponderous legal system! Just make your claim and that’s it. Surely God would strike down anyone to make such a false claim? Let’s see…. Have no other God’s before me. If someone isn’t seen worshiping God or praying constantly, or perhaps they don’t carry their Bible around with them everywhere, then they must not be putting God first. Stone them. Remember, proof isn’t needed, just the accusation. Remember, homosexuality is a very serious crime, so now we can stone the evil abominations’. Remember, just pick a commandment, accuse someone, and they get stoned! Now that’s simple justice! Now we don’t need all those evil lawyers, but we don’t want them in our clergy, so surely we can find the sin in their life and expose it till there are no more lawyers. Being rich is a severe stumbling block to ones salvation, so in order to help the rich along toward the path of righteousness, the church will confiscate all their wealth. The problems brought on by wealthy people using their money to become even richer are legion, and nothing good will ever come of it. Everyone will earn only a minimum wage so that we will stay humble and obedient to God. Now we are totally obeying God’s law, but just to remove as much temptation as we can we must reenact some old practices. Yes, Sarah Palin is right but she doesn’t go nearly far enough. We must burn all books beside the Bible! After all anything besides this book is unnecessary and could possibly lead someone astray. Oops! How silly of me! I forgot that all the products of the evil Science must be removed as well! It must be evil to have cell phones, computers, tv’s, air-conditioning (hot and cold), automobiles, or any technology that cannot be made personally. After all, it was the fruit of the tree of Knowledge that Satan used, so it must have been near and dear to him, especially since God himself told us not to touch the stuff. In order to be more holy we must rid ourselves of as much knowledge as we can. The Republican and Tea Parties have shown us the way, but we must build on their foundation. Now we are much better off! We have far fewer worries! We don’t have to be so concerned with others violating our civil rights, because we have only those rights that God gives us (as determined by the Pope). Just to be safe, though, I’d keep well to myself lest someone decides they just don’t like you and make an accusation against you. We know where that leads. Look on the bright side, now the governmental debt will soon be reduced to zero! Most governmental spending is on things we will no longer need, like programs for education, welfare, arts, and maybe even the C.I.A., N.S.A., and many others. Of course, we may decide to up our military budget so that we can finally launch a strike to rid ourselves of all the other religions at home and abroad, but that will surely end sometime. Meanwhile, we only have to pay ten per cent to the church, rather than in excess of twenty five to the government! Forget retirement! If your family cannot support you in your old age, then you’ll likely die without advanced medical care or at least of starvation being left to your own devices. Now I’m sure someone, especially those who keep trying to make this country a more Christian one would disagree with this assessment, but it is all in the Bible and MUCH WORSE! The fact that they refuse to acknowledge that this is what Jesus preached just shows that they aren’t really reading it or they aren’t really comprehending what they read. As for me, I think we have far too little separation of church and state as it is. I don’t think religious organizations or clergy should get a tax break, and I don’t think Federal funds should be used to support religious organizations or be sent to State or Local governments that give money to religious organizations. Why? It is completely unfair to other religions that are “unrecognized” and so don’t qualify and to secular organizations who can’t get those monies.